Where Can You Find Dinosaur Remains? The Visitor Center displays la rge therapod tracks and provides informatio about a site of tracks in the Wingate Formation north of Bullfrog. Exhibits include an impressive collection of fossil footprints, including Chirotherium from the Triassic Moenkopi Formation and dinosaur prints from the Jurassic Glen Canyon Group. Two nearby sites exhibit tracks of two types of lower Jurassic Therapods in the Kayenta Formation. Although it is now dry and dusty, the park was once the tropical homeland of some of the earliest known dinosaurs. Exhibits include skeletons of a nicrosaurus and Gertie, a chindesaurus that was discovered here. This private high school collection has the largest display of fossil footprints in the western US, and includes dinosaur tracks from Grand Canyon's Coconino Sandstone. Just beyond the western edge of the Colorado Desert, this exhibit purportedly contains the only dinosaur tracks ever found in California. This second-oldest scientific institution in the western US displays an allosaurus and some of the few dinosaur remains ever discovered in California. Colorful, larger-than-life statues of tyrannosaurus rex and apatosaurus are visible from Interstate 10, just west of Palm Springs. Dinosaurs Hall exhibits stegosaurs, coelophysis, edmontosaurus and an incredible tyrannosaurs rex. Headquarters of the Dinamation International Society, the museum contains 14 scientifically accurate robotic dinosaurs and a paleontologic laboratory where fossils removed from local quarries are prepared for scientific study and exhibit. Managed by the Museum of Western Colorado. In 1900 a brachiosaurus, the world's largest known dinosaur, was found here. Take Highway 340 west from Grand Junction to South Broadway; Dinosaur Hill is located at the intersection of Meadows Way. Open year-round, weather permitting. One of the best dinosaur bone beds in the world where 11 species have been unearthed so far. At the Quarry Visitor Center views a wall of rock embedded with 1,600 real bones, and watch paleontologists demonstrate their skill. Note: A beautiful, full-color book on Dinosaur National Monument is available in DesertUSA's online store, The Trading Post. Dinosaur tracks of ornithopods and theropods are preserved in beds of 100-million-year old Cretaceous Dakota Sandstone. 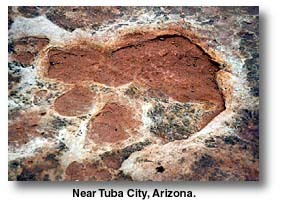 Dakota Sandstone has so many dinosaur trackways preserved nearby that this area has been nicknamed the "Dinosaur Freeway" by paleontologists. North America's largest dinosaur tracksite requires a 5-mile hike into a remote canyon. Jurassic sauropods and therapods. A division of the Museum of Western Colorado, this is a working paleontology laboratory featuring fossils from important discoveries in western Colorado and eastern Utah. 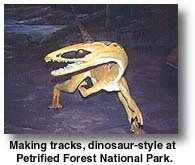 Many dinosaur exhibits are of articulated dinosaur skeletons and realistic, half-size animated dinosaur replicas. Day digs and major expeditions are also offered to the public. Dry Mesa is where the giant ultrasaurus, the sauropod killer torvosaurus, delicate pterosaurs, and other fossils of the Morrison Formation have been found in the Uncompahgre National Forest near the east fork of Escalante Creek. This excellent educational center is associated with the famous dinosaur quarry nearby where 17 new dinosaur species were discovered, including the stegosaurus. Features a 30-minute video history of Dinosaur Ridge and interactive displays. Partial skeletons of stegosaurus, allosaurus and possibly brachiosaurus are visible along a 3/4-mile trail cooperatively constructed by the BLM and the Museum of Western Colorado. The one mile "Trail Through Time" offers an array of significant dinosaur specimens still preserved in ancient stream channels on 286 acres set aside as a natural area. Managed in conjunction with the Museum of Western Colorado Dinamation International Society. Rocky Mountain Dinosaur Resource Center - Woodland Park, Colorado. A new 20,000 square foot dinosaur museum. Exhibits include huge marine reptiles, pterosaurs, remarkable dinosaurs, a visible working fossil lab, educational activities, interactive children's area, and a great gift shop. Open 7 days per week year round. Dinosaurs of the Ancient Rockies includes skulls of triceratops, diplodocus and carythosaurus. Okay, so they're not dinosaurs, but here lie North America's most spectacular giant marine reptiles deposited off the west coast of Pangea 220 million years ago. More than 500 ornithopod and therapod dinosaur tracks are preserved in the lake spillway with interpretive walk. Several exhibits of New Mexico dinosaurs include pentaceratops and albertosaurus fossils. Mesalands Community College’s Dinosaur Museum in Tucumcari, NM. This museum offers a unique combination of the typical resin cast skeletons along with an amazing selection of bronze cast skeletons. It also has a working lab where students learn about and work with fossils, as well as at least one annual (sometimes two) dig events. Exhibits include a large track collection containing cretaceous sauropod tracks. Exhibits here include dinosaur footprints and casts. The most famous dinosaur tracksite in Texas is located on the banks of the Paluxy River where therapods attacked sauropods. In DinoDig, a reproduction of a working dig site, children can search the sand for realistic fossil replicas using a plastic digger and a two-inch chip brush, and they can keep most of what they find. This museum has one dinosaur exhibit, camptosaurus footprints 50 miles from the facility. Exhibits include articulated skeletons, skulls, a dinosaur egg and more. Excavations have unearthed more than 30 complete skeletons, 12,000 individual bones and several dinosaur eggs here at the world's primary site for Allosaur skeletons, the largest carnivore of the Jurassic period. View reconstructed dinosaur skeletons and fossils common to eastern Utah including skeletons of allosaurus, stegosaurus, camptosaurus, and camarasaurus from the Cleveland-Lloyd Dinosaur Quarry and tracks of Cretaceous dinosaurs from the area's coal mines. Dalton Wells Dinosaur Quarry - near Moab, Utah. Operated by the Museum of Western Colorado. Exhibits include dinosaur tracks and a dinosaur femur. Visitor Center has a small display of dinosaur bones. One of the best dinosaur bone beds in the world where 11 species have been unearthed so far. At its Quarry Visitor Center, families can check out a wall of rock embedded with 1,600 real bones and watch paleontologists demonstrate their craft. Most of the 100 life-size models that inhabit this outdoor dinosaur park are hands-off, but several are intended for climbing. Morrison Formation dinosaur fossils and petrified wood can be seen in a natural setting on a one mile hike. This outdoor museum is an experiment in which visitors are expected to assist with the effort to protect the site against vandalism. This new museum, formerly a part of the Emery County Pioneer Museum, highlights the natural history of the San Rafael Swell and features mounted skeletons of dinosaurs discovered in Emery County. 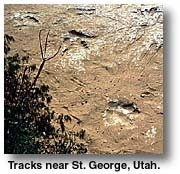 Dinosaur tracks can be seen along the Potash Road Scenic Byway, State Highway 279, which follows the Colorado River south of Moab. Located approximately four miles along the road from its junction with US 191, which is four miles north of Moab. More than 200 bipedal dinosaur tracks are exposed along the reservoir shoreline, which was once Jurassic oasis in a land of desert sand dunes. Sauropod tracks are seen making a sharp turn to the right, a phenomenon rarely observed in fossil trackways. Site may be reached by a 2-wheel drive dirt road off U.S. Highway 191, 23 miles north of Moab. Adjacent to an excellent geology and natural history museum, the Dinosaur Garden contains an array of full-sized, lifelike dinosaurs and other prehistoric animals in a natural setting. Excellent collection of Jurassic dinosaurs, including allosaurus, camptosaurus, stegosaurus, and dimetrodon. Articulated skeletons of allosaurus and partial dimetrodon, plus skulls of allosaurus, camarasaurus and camptosaurus. Excellent footprints in late Triassic Moenave Sandstone made in a low floodplain. The sandstone at Arches National Park has provided the palette for sensational desert vistas and arches, making this park unique. Nature has used wind, rain and ice to carve fantastic desert vistas and arches. Join the DesertUSA team on a tour of some of the incredibly beautiful natural features at Arches National Park.